Frank Laric (1921-2010) was born in New Mexico but lived in California for most of his life. Before and after WWII, he worked in the movie industry, mostly in westerns. He was also a singer and both he and Nelson Eddy shared a voice teacher in the mid 1940s, Major Herbert Wall. Frank Laric had several conversations with Nelson Eddy during that time including one in which Eddy’s relationship with Jeanette MacDonald was discussed. Frank sang with the G.I. Chorus and was in Eddy’s last movie, “Northwest Outpost” (1946). Frank also wrote country songs and dabbled in writing short stories, poetry and novels. He additionally did police work, was a founding member of the California Association of Licensed Investigators, Inc., and operated a private patrol agency, Los Angeles Guard Service, for over thirty years. 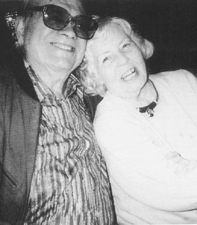 Frank Laric was one of the very first members of the Mac/Eddy Club and a staunch supporter of author Sharon Rich’s then-controversial decision to reveal the details of the Eddy-MacDonald relationship. Frank’s loyalty was based on his own experiences in knowing Nelson Eddy and learning a lot of information in the 1940s, some directly from Nelson. Frank knew about Nelson’s war work, the Nelson-Jeanette disagreement over Nelson making “Northwest Outpost” with Ilona Massey as co-star, about pregnancies, Gene Raymond’s sexuality and other data that was not broadly discussed otherwise until the late 1970s. Frank also located others for Sharon to interview who had known Eddy or MacDonald during the 1940s to both verify information and provide additional facts. The following excerpts are from the videotaped Frank Laric interview which appeared in a two-part article in Journals #24 and #25. c. 1983, 2005. All rights reserved. It was early or the summer of 1941 [presumably Nelson’s concert at the Orpheum Theatre, February 4, 1941]. I went down to San Diego to see Nelson’s concert. I had a girlfriend who lived in San Diego and she picked up the tickets for me, about three rows from the orchestra pit. It was just Nelson and his accompanist and it was a real thrill. Nelson came on, he looked so great – he looked terrific! I saw Nelson in two other concerts after that, one in Los Angeles and one in San Francisco. It seemed like he followed a certain pattern. He used to sing songs like “The Blind Ploughman” and classical and semi-classical arias. On all three occasions I saw Nelson in concert, he would stop and take requests from his motion pictures with Jeanette. The first concert was extremely interesting because unknown to anyone and unexpected even to Nelson himself, Jeanette showed up at the concert. Nelson had just gotten through singing “Rose Marie,” I think it was, and started singing “Will You Remember”…and he got through the intro and got to “Sweetheart, sweetheart, sweetheart.” And lo and behold, Jeanette’s voice came into the theater singing, “Sweetheart,” and everyone stopped and looked around. And she started walking down the aisle. She’d been seated up at the back. Halfway down she started to sing. Nelson – the look on his face was unbelievable, he was so touched. But he was a trouper and he kept on singing. And you could see how pleased he was. And of course everybody was looking around at Jeanette and Nelson, everybody was excited, it was so dramatic. She walked right up and by the time they got to the last chorus they were both on the stage. They were practically touching, you know, looking into each other’s eyes and singing. And then they finished the song and everybody was standing up and cheering! I heard him – I was so close – I heard him say to her, “Where’d you come from?” She said, “I got in last night.” And he said, “Well, are you alone?” She said no, some girl was with her, I didn’t know who she was. “Where are you staying?” And she said, “I’m staying at this hotel here–” I don’t remember the name, the Aztec or something, the big hotel where the old 101 freeway used to hit right dead into, this side of Coronado Island. And he says, “Well, let’s have dinner tonight,” or something about dinner. There was so much going on I couldn’t hear it all. But they were like two little kids, they seemed so thrilled, so happy. She seemed so happy. Then they turned around and the audience cheered and they sang “Indian Love Call” together. Then she graciously left the stage and went back up the aisle to her seat. Nelson kept on and sang a few more songs and you could tell he was just really excited. After the performance, everybody turned around to see Jeanette but she’d already got up and left. She was gone out the back. She went around to the dressing room.